The Santa Clara Sporting Club is preparing to host our 16th Annual Invitational Tournament on August 9th-11th. This event is for Premier-Level Boys Teams in the U8-U19 age group. 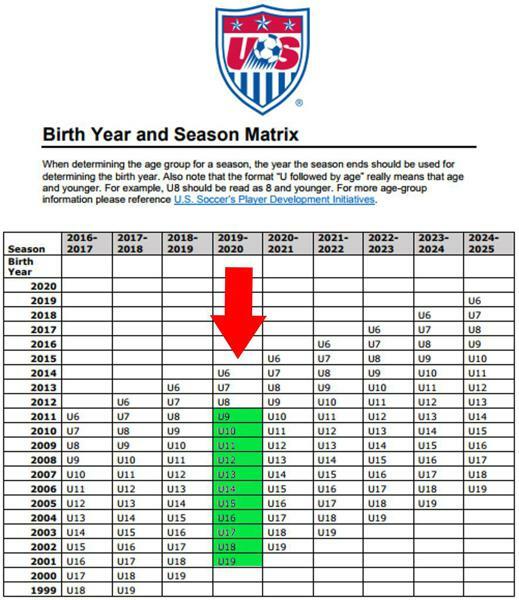 To verify your correct age group, view chart below. 2019 Fields Fremont Sport Complex/Lake Elizabeth, DeAnza College, Chabot College, Santa Clara Youth Soccer Park. Please note that all locations are subject to change. Tournament Hotels ( Stay-N-Play ) - ALL travel teams must book in an official hotel to receive tournament acceptance. Teams withdrawing after acceptance will forfeit their entry fees. Any team withdrawing must done in writing and postmarked no later than July 9, 2019. Applications will be reviewed and accepted or rejected based on pre-established criteria. The objective will be to provide evenly matched competition. Only properly sanctioned and complete applications will be considered for acceptance. Notification of acceptance or rejection will be communicated to applicants no later than July 1, 2019. 1) All rosters must be updated by 5:00 PM Wednesday August 7th, 2019. 2) All players that are playing in the tournament must be on GOTSOCCER Roster. All players must have a current player pass or equivalent national association and medical release. All teams that are not US Club Soccer members will need to submit travel papers to their local State Association. Player Passes, Roster and Coaches passes must be the 2019-2020 Season Credentials. Members of US Club Soccer do not have to obtain travel papers Tournament Fields. Important: The tournament starts on Friday morning as early as 8:00AM and all teams will be scheduled to play their first 2 games on Friday. All players need to register their profile for college coaches attending the event. The Sporting Invitational is a Stay-N-Play Tournament. Santa Clara Sporting has partnered with Traveling Teams Accomodations for this tournament. Teams using hotel rooms are required to obtain them from the approved hotels Please click on the link to block you team’s rooms. Hotel confirmation will be required before acceptance into the Santa Clara Sporting Invitational becomes final. Please contact Monica Winkley/Client Services Manager at Traveling Teams monica@travelingteams.com or by phone at 866-468-3268 x899 to make reservations or book online. Information above is subject to change if needed.